We are Long Island’s leading poison ivy removal service company. We specialize in keeping your family and your pets safe with the immediate removal of poison ivy. We will also remove other forms of invasive or poisonous weeds that are tough to control on your lawn. Alternative EarthCare will safely remove hazardous plants from your property without harmful chemical sprays. Alternative EarthCare uses least toxic methods when spraying for poison ivy. Our methods will control and exterminate poison ivy and poison oak- we guarantee it! Yes, we are so effective at eradicating poison ivy and poison oak that we provide a full 1 year guarantee against their return. For full eradication of these harmful plants we recommend our 3 step program; and therefore our guarantee only applies after all 3 steps of the Poison Ivy program has been completed. NOTE: The involved, lengthy root system of these intruders is HAZARDOUS to work with, which discourages digging as a corrective alternative. 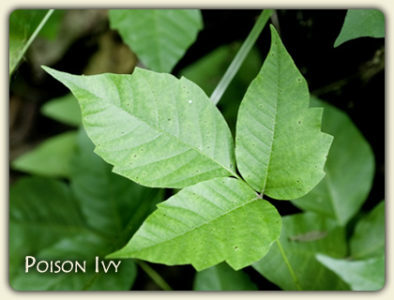 Poison Ivy has a distinctive leaf pattern of three leaflets occurring alternately along the stem. Leaflets are usually fairly smooth, and can be either dull or glossy green. Leaf edges may be smooth, toothed, and (rarely) lobed. Large mature leaves often have several large teeth (cutouts) on either side of the broadest part of the leaf. Leaflet sizes vary from a quarter-inch to over 2 inches in length. Leaves on the same vine often have a number of color and shape combinations. Flowers, though usually brief and rarely noticed, are clustered and small, and are yellowish in color. The berry-like fruit ranges in color from yellowish-green to whitish-gray and is clustered, small, round and waxy, extending out above a leaflet group. Poison Ivy can grow as a self-supporting woody shrub, as a thin trailing vine running along the ground, or as an aerial-rooted vine growing on shrubs, trees, power poles, and fences. The aerial-rooted specimens often have a wooly or fuzzy rope-like appearance. Older (ten years or older) vines can grow to several inches in diameter as high as 30-feet. Poison Ivy is a perennial plant that is reproduced by seeds and woody rhizomes. When its leaflets first appear, are usually notable by a shiny, reddish-green color, usually slightly toothed and not as smooth as more mature leaves. In the summertime the poison ivy leaves are various shades of green, but are usually dark green. Every year in the fall the leaves will turn all kind of beautiful shades of orange, bright red, tan and yellow before eventually turning brown and dropping off the tree. 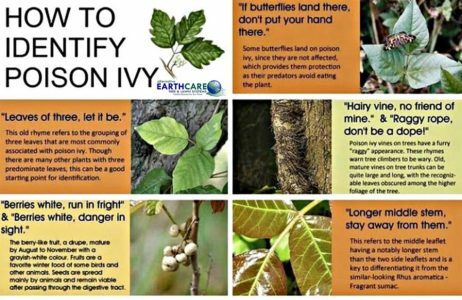 Millions of people have reactions to Poison Ivy each year. The allergic agent in Poison Ivy is an oily substance called Urushiol (pronounced: ur-oosh-i), which is a collection of oleoresins. It is found in all parts of the plant and can be transported by wind or smoke as well as through direct contact. Symptoms of poisoning range from mild itchiness and redness, to severe oozing lesions accompanied by fever. While people may not develop dermatitis from the first contact, most people are sensitized the first time. 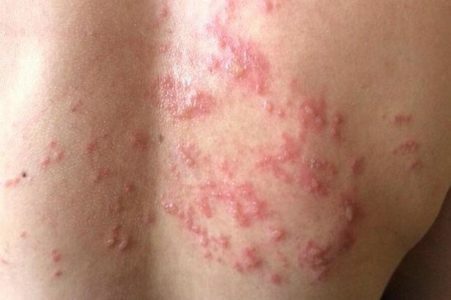 This means that although as a child you may have not gotten a rash from contact with the plant, you may develop a terribly painful rash as the years go on and the most often you come into contact with it. Urushiol can contaminate footwear, clothes, tools, and pet fur, therefore there is always a potential of transferring the plant oil without any direct skin contact at the time of exposure. The oil can even remain active on footwear, clothes, and tools, etc. for as long as a year! Smoke inhalation (breathing the smoke) from burning Poison Ivy, can also cause severely dangerous poisoning, as the soot particles can carry the oil. Poison Ivy dermatitis (irritation, blisters, sores) can start within a few hours or up to a week after contact (or even longer with subsequent repeated contacts with contaminated clothes and tools.) It may progress from itchiness and swelling to inflammation, and the formation of lesions and blisters. The time factor is dependent upon personal sensitivity, the amount of exposure, and the season. Spring and summer are the seasons of greatest potential for poisoning. Damaged leaves and stems most readily produce the oil for significant contact, which is easily transferred to skin as well as clothes and tools. Scratching will spread the reaction as long as the oil has not been washed from the skin. The fluid from blisters caused by the oil will not spread the reaction (once the skin has been thoroughly washed.) Washing with Dawn/Joy/Palmolive dishwashing liquid (any modern dishwashing detergent with a “degreaser” agent – not just normal soap!) or lye soap (though I don’t know that many people who keep lye soap around the house nowadays) is reported to neutralize the oil of Poison Ivy for many people. To avoid the dreaded rash caused by poison ivy, get rid of the plant today. Avoiding direct contact is not a practical option if you have children and especially pets, who can go anywhere and everywhere, including near that poison ivy plant. 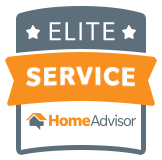 Call today for a free estimate and ask us about our 1 year guarantee against poison ivy and poison oak!